Given its popularity in the US and European markets, the new third generation Santa Fe has been engineered not just at the South Korean HQ but also carries a large number of inputs received from various global teams. The Santa Fe was launched in India at the Auto Expo, in three variants - 2WD Manual Transmission, 2WD Automatic Transmission and 4WD Automatic Transmission with prices starting at Rs 26.3 lakhs (ex-showroom Delhi). Hyundai has taken the now the very popular fluidic design philosophy of its sedans to the next level with the Santa Fe. It calls this iteration of its family look, the Storm Edge design language. This means the SUV has lost some of its curves and is now bolder and more aggressive in its overall design - making the outgoing car look almost meek or tame by comparison. The front hexagonal grille is finished with chrome along with sleeker Xenon headlights and LED daytime running lights - which make the face of the SUV look stronger. The fog lamps now come with a cornering function which automatically lights up with the turn signal. The wheels are 18 inch diamond cut alloys in keeping with the premium position Hyundai is going for. Surprisingly, the car's ground clearance (185mm) is actually lower than that on its predecessor (200mm) - despite the bolder stance. The cabin of the Santa Fe is roomy and has a rich feel to it, with build quality certainly at par if not better than the immediate rivals. The SUV is packed with features like steering-mounted audio and Bluetooth controls, cruise control, and also rear parking-camera display on the touch screen. But the 4.1 touchscreen looks a bit small and out of sync on the large dashboard which is otherwise packed with a whole host of buttons. This is a seven seater SUV and the last row which can really accommodate only children can be folded flat to free-up boot space. 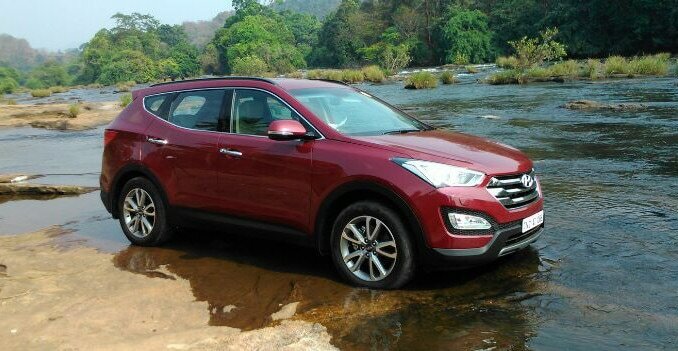 Under the hood, the Santa Fe retains the third generation 2.2 litre CRDi engine and Hyundai says the six-speed automatic transmission is now more refined and also more fuel efficient. Hyundai claims mileage of 13.01 kmpl on the Automatic and 14.74 kmpl on the Manual. The diesel engine offers 194 bhp and is fairly quiet, and there is lots of power on offer - allowing for smooth performance at low and high speeds. But the engine does grunt when you push it especially when the turbocharger kicks in. The Santa Fe offers a Flex Steer system which let's drivers choose the steering modes (Normal, Comfort, Sport) to drive on. This changes te steering response, and the feel of the wheel itself - affording a different driving character, without having to alter the throttle response or suspension setting. Overall, the ride on the SUV feels smooth with the suspension really taking the hard bumps on the road with ease. The Santa Fe will take on the other SUVs like the Toyota Fortuner, Renault Koleos and the Ssangyong Rexton, Chevrolet Captiva and Mitsubishi Pajero Sport.